House of Sand, which I caught earlier this year at the San Francisco International, is currently in distribution and receiving favorable reviews. It will be opening up in Bay Area Landmark theaters next week—at the Lumiere in San Francisco and the Shattuck in Berkeley—and I strongly encourage folks to catch this sumptuous, stately film. The Landmark website has Andrucha Waddington's Movienet essay on the photograph that inspired the film. With customary skill, Dave Hudson has gathered together the critical response for the Greencine Daily. Hannah Eaves has, likewise, provided an interview with director Andrucha Waddington for Greencine's coffers. Though I have previously posted my own interview with Andrucha, Dave inspired me to work up my notes from the Q&A following the film's first festival screening. Due to an unfortunate and somewhat clumsy shift to an available vacant space from the original house in which the film was screened—which had to be quickly vacated for the next film—Andrucha Waddington lost most of his audience, making attendance at his Q&A sparse. That didn't interfere, however, with the discussion being informative and insightful. The first comment was posed as a "silly plot question." What did Massu do to keep Áurea and her mother Donna from leaving that forsaken place? Andrucha responded by saying that Massu used silence to keep the women from leaving. He didn't tell them he saw the return of the scientific caravan and he admonished his son not to tell them as well. They had a tacit agreement. The scientists had said they would return in six months to photograph the same sky again, Massu and his son spotted them, but didn't alert Áurea. He didn't want her to know because he didn't want her to leave. Andrucha was asked if the scientific expedition was an actual historic event and he confirmed it was. The expedition to Brazil had been sent by Albert Einstein to prove his general theory of relativity. Einstein sent not only this expedition to Brazil but another to Africa to photograph the solar eclipses and to follow-up with photographs of the same sky six months later to prove that light bends with gravity. 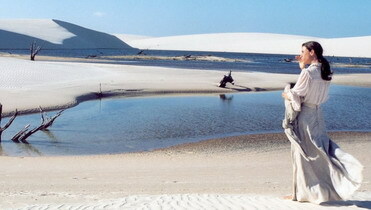 The skies in Africa were clouded and the theory was proven through the Brazilian expedition, which occurred about a hundred miles from the Lençóis Maranhenses National Park where the film was shot. Andrucha was asked how difficult it was to film the movie and if the film crew was anywhere near stores. "No. Not anything," Andrucha responded, "It was a hell." They operated out of a tiny fisherman's village of roughly 1,900 fishermen. There were no hotels so they had to spend a year working out logistics. The entire film was shot on location, even the interiors. The co-producers tried to no avail to convince Andrucha to shoot his interiors in the studio after location shooting but it worked better to build the houses on location and to shoot the interiors there because—after 8:00 in the morning—the sunlight was so hard that they had to necessarily retire to the interiors for respite. After shooting the interiors, they could return outside once the sun had gone down somewhat. They would start shooting at 5:00 in the morning every day, first exteriors from 5:00 to 8:30, then interior shots for an hour and a half, followed by a three-hour break. They would return to the set at 1:00 and then work from 1:00 to 6:00. One woman asked if the house was built from sandbags and Andrucha clarified it was built from an adobe-like mud and wood collected from the village. He was asked how many cameras were used and he answered two cameras for the whole movie. They actually had to replace four separate cameras because of the sand. During the eight week shooting schedule they had five of the eight weeks where they were shooting with only one camera. One fellow complimented the film's painterly look and wondered if Andrucha had been inspired by any particular painters. Andrucha claimed to be totally inspired by the location, which—though beautiful and amazing—he wanted to portray as harsh and unfriendly. He partially effected this by not using polarizing filters, thus making the sky white. He consciously and purposely wanted the movie to be bathed in harsh, white light, the sky white, the dunes white, saturated in tones of white and grey so the audience could sense how difficult it really was to stand outside in the direct sunshine. I was intrigued by the question because I had read somewhere that Andrucha had actually been thinking of Caravaggio and Latour when coming up with his cinematic design. He qualified that—though he loved Caravaggio and Latour—they had nothing to do with the look of the movie. He and his cinematographer Ricardo Della Rosa did not talk about painters when they were planning the shoot and trying to find the look of the movie. Instead, they spent a week beforehand testing the light to see what they could accomplish. "It was very hard to work only with white and white and white. We decided to bring white to the sky as well." They shot all the exterior shots, always against white, to have this whitish sky instead of the blue sky that you would have if you shot in less heat or were adjusting for the light. One young woman praised the film's costume design noting how—when the daughter Maria is grown—she's wearing what looks like the old Victorian tablecloth made into a dress. She felt this skillfully portrayed the passage of time and wondered who did the costumes and if they had worked on anything else. Andrucha credited Claudia Kopke, who likewise did the costume design for his previous film Me, You, Them and who has since worked on other Brazilian films. In his initial discussions with Kopke, Andrucha placed these precise limitations upon her, "Okay, these people, they will take with them only a couple of the fabrics and a couple of clothes that they will have to adapt during the movie." As the film was shot chronologically, Kopke built the costumes chronologically, beginning with the initial Victorian silhouette that gradually changed as the characters began loosening their clothing, cutting their sleeves for example, to adapt to the demands of their new environment. Claudia adapted the clothes as time went along, shooting first in the 1910 block, then 1919, then 1942 and finally 1969. Andrucha was asked how he came up with such a beautiful, philosophical end to the movie and he outlined how he didn't have an end for the film for at least two years writing the script. One evening around 10:00 p.m. he was putting water in a bus and suddenly had the idea to have Fernanda Montenegro coming back and seeing herself. "Maria would be grown up. It would be her with her. Then I run to the room and—actually Fernanda Torres is my wife—so I run inside to the room and I said, 'Fernanda, I found the end! It's a mirror that she will see herself in her daughter.' " Having already decided to use two actresses leapfrogging roles, having the young Fernanda Montenegro as the mature Maria meeting up with Fernanda Montenegro as the aged Áurea underscored the notion that we look a lot like our parents even as we are totally different. The idea about incorporating the landing on the moon came about in a discussion between the writer Elena Soarez and with Ruy Guerra. Ruy Guerra, who played the role of Vasco, is himself a well-known director in Brazil. In one of the readings he commented that—even though men landed on the moon—they didn't really find anything. So the ending to the film evolved organically by exploring and building up the original ideas. One fellow was intrigued by Andrucha's decision not to contrast the barren landscape with references to the city from where the characters had come. Why had Andrucha decided not to show them leaving the city for the dunes? Andrucha felt that the city was represented by Áurea, Maria and Vasco and the arrival of the caravan to the dunes. Admittedly, at a certain point he and Soarez had considered including a scene in the script showing the characters leaving the city, but, then asked themselves why they should do so? They decided it was more interesting to begin the movie with them already lost and exhausted, arriving in this place where you understand slowly what's going on. The first dialogue of the film starts ten minutes into the movie so, granted, some people in the beginning of the film might not understand why these characters have traveled so far. Then again, why should he respect the expositional formulas? Why underestimate the audience? Why not let them think for themselves, guess the answers to their own questions by watching the film, reach their own conclusions without the dialogue telling them everything beforehand? Andrucha complained that too much of contemporary cinema predigests the information for the audience, not giving them the chance to chew for themselves. Despite his explanation, the fellow clung to his original question and still wanted to know why Andrucha had not provided a scene in the city for contrast. Andrucha explained again that the film was about the place these women had come to, not where they had come from. The seminal idea revolved around Áurea originally not belonging to this place, to this house of sand. By the time she accepted her destiny, she had become part of this place and there was no reason for her to leave anymore. "So that's why," Andrucha concluded, shifting to the next question. One audience member wasn't sure if Vasco had died when the building collapsed and Andrucha confirmed that, yes, he had been killed and that this was "a black humor." Andrucha was asked if there were any filmmakers who had inspired this work and Andrucha admitted there were two: Hiroshi Teshigahara, Woman in the Dunes, and Luis Buñuel, The Exterminating Angel. These were the two films that encouraged him to film House of Sand. One woman asked for clarification about the final scene where Maria returns as an adult to see her mother Áurea. Maria tells her mother that men have landed on the moon and Áurea asks if they found anything. Maria answers, no, nothing but sand, to which Áurea responds, "Then I didn't miss anything." Did she hear that right, the woman asked. Yes, Andrucha confirmed, the idea being that—as far as Áurea was concerned—why should men go so far to find sand on the moon when she was living on the moon for almost 60 years? The woman then asked if Áurea had started to like living in the sand and Andrucha answered that, once Áurea found her love for Massu, she belonged to that place. Andrucha was asked what it was like to work with Fernanda Montenegro? He replied she was an amazing, phenomenal actress, a working class hero who was ready every day to do everything she could for the movie. All the actors in the film, Andrucha expressed, were passionate and believed in the project more than he had ever expected so, of course, directing them was a nice experience. Andrucha was asked why Massu's character didn't talk very much. Was that intentional? Andrucha stated it was a fact of Massu's personality. He was a no-talking person who spoke through action. Andrucha pointed out that the women would have died if it hadn't have been for Massu's actions. One audience member expressed her delight in how Andrucha achieved the time lapse effect of switching from the first dynamic of the story between Donna and Áurea to the second dynamic between Áurea and Maria. "It took a minute to get," the woman offered, "that Áurea now looked like her mother and her daughter looked like she once did." Andrucha expressed that he preferred using the time lapse over indicating dates on the screen to register the passage of time. He decided not to use such predictable locators and to, again, let the audience think for themselves, figure it out for themselves. "Have a cut and you see the child coming down the dune. Have a cut and you see the war planes. And then you see that Fernanda Torres is walking the beach with a bottle and then you don't know, you're not sure if that's not Áurea, and then you see the mother looking from the top of the dune and then first you think it's a ghost and then you understand in the next scene. In this film we tried not to explain everything right away but to make it flow." 08/12/06 UPDATE: With the selfsame focus and eloquence that he admires in House of Sand, Eric Kohn provides an appreciative and poetic synopsis for The New York Press.